Derbi vs Sikk vs FX "play bikes"
I recently came across this concept bike from DERBI(below) and thought that it was interesting enough to do some research, so I though I would post up what I found. The Sikk trail bike has been around for some time as kind of a play bike that has an appeal to the mountain bike market. This concept bike seems to have a lot in common. The name "DERBI" comes from "DERived from BIcycle". 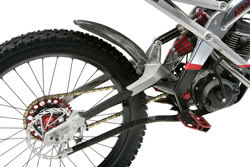 The Derbi DH, is for downhill. It is interesting that this bike is referred to as a "downhill" bike while the sikk bike is a "trail" bike. I am sure neither bike would have the power to be considered a hill climber, motocross, or off road competition bike, but perhaps the "play bike" category can cover both since they really are in a new category apart from mountain biking or motorbiking. 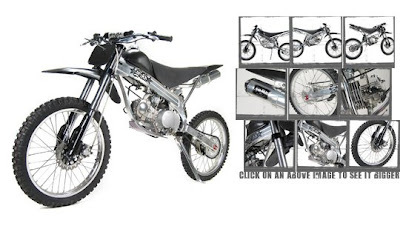 The DERBI bike comes with a 100cc 4-stroke motor and weighs an impressive 88 pounds! weather or not the power is enough for an 88 pound bike probably remains to be determined by the rider. The claim is that the engine is "the key to climbing where we want to begin the decent" The engine is said to be dis mountable for those who want the pure feeling of the machine, although I don't know where you would leave the motor? You can't pedal back up to get it, if you have a truck to leave it in then why would you need the motor to get you there in the first place? I suppose they are thinking that you leave the motor at home and shuttle up? Also, it has an automatic transmission, and you may have noticed that there seems to be no gas tank. The fuel is stored in the frame! They have definitely done everything humanly possible to keep the weight down on this little bike! The tires, chain, and drivetrain are much more like a mountain bike than motorbike hinting to the possibility of a gutless POS. Here's a link to see what else they say about it along with a few pics. In comparison the Sikk bike has a 125 cc, 9hp 4-stroke engine, weighs around 160 pounds, has an actual 1.3 gallon fuel tank, real to life 19" rear wheel and 21" front wheel, and a 4 speed manual transmission. I actually saw this bike in person, and it is TALL! Now, that can be a good thing or a bad thing depending on how you look at it. Obviously if you are a tall person, then it won't matter too much AND you gain ground clearance in the process, but if you are short and light then this might not be the bike for you. 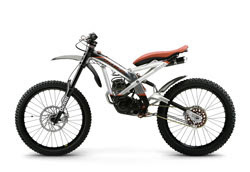 It is tailored to a taller, heavier rider with it's stiff rear suspension. The person I talked to about this bike was talking about becoming a dealer and offering a solution to the stiff rear end, but I have not followed up on this. There was an article in motocross action magazine about this bike and they had some very good things to say about it. I have read that the bolts need to be tightened down often when new etc., so the quality may not be quite up where it could be, but it looks decent for the price at around $1,800. And Finally we have the FX Trail bike. This one definitely looks like it packs a punch! At 17hp and 125 pounds this 125cc machine is nearly twice the hp of the Sikk at less weight. The power of this bike will actually make it feel lighter than the DERBI when climbing hills or accelerating. It's a funny thing how power can do that to a bike, but it really does. This kind of hp and technology comes at a price though. At right around $5,000 why not just lay the cash down for a new dirt bike? I am sure someone will tell me, and I am sure they will be right. 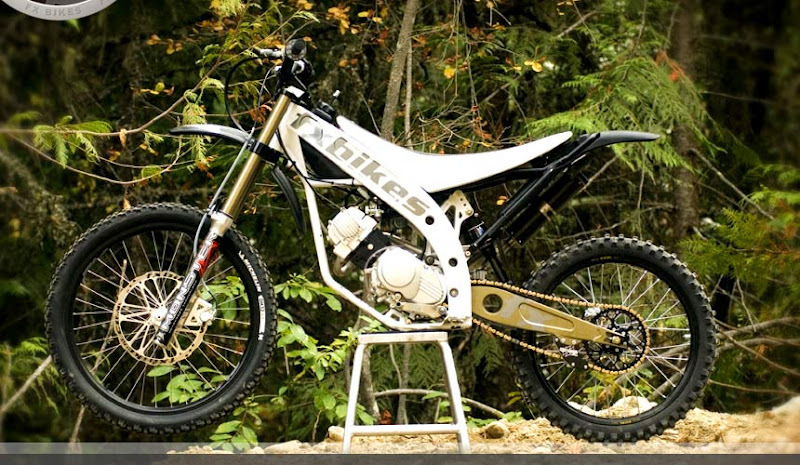 There is a place for a smaller bike such as this with the quality of a "real" dirt bike. I do think they look awfully fun, but while I am roosting by with my CR that cost half as much..well, let's just say it's not for me...still cool though! Click here to download an article published about the bike. Or check out these videos!